The Flutes have had a flovely fall semester! 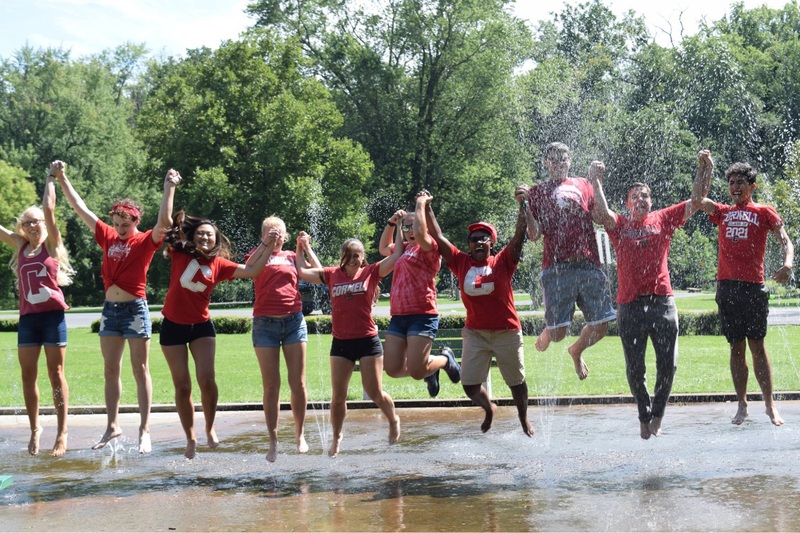 We’re proud to say we’ve nearly doubled in size with a large freshmen and new-member class. 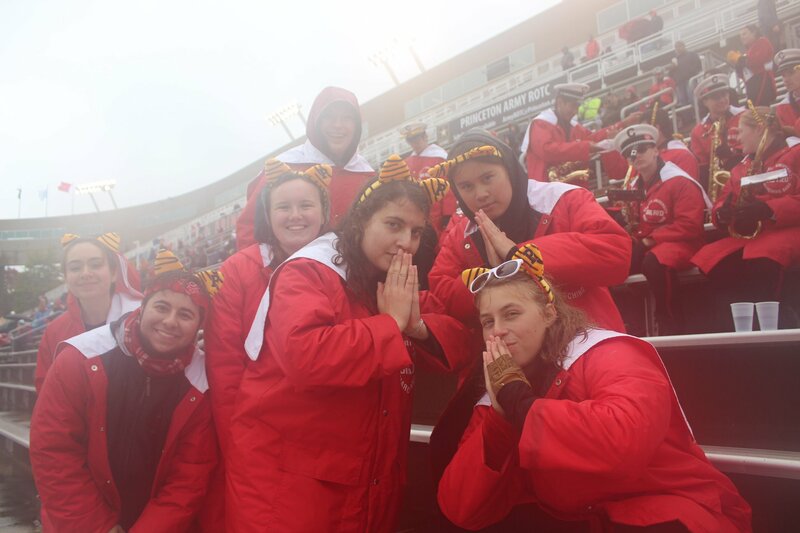 With all these new bandsmen, we added rank U to our existing ranks of B, A, and D. We continue to uphold our traditions of flute-ups, flute naps, fancy flute, chopsticks, kumcha, etc., while adding new things to the mix. This year, we held a “Chopped”-styled event where flutes competed in an epic bake-off. Everyone had a blast! We also had fun meeting olds at homecoming and all the games since. Continue to visit us and we’ll be happy to share our baked goods! The Clarinets have welcomed in a great new class of freshman plus a few upperclassmen! We’ve had multiple people learning the clarinet this semester who are all doing extremely well. We had some great times on all of the away trips this year! The section has been sounding GREAT given the hard parts thrown our way in basically every show so far. Additionally, we’ve had a fantastic time with some of our section bonding events, like spoopy pumpkin carving and our apple pie making tradition. Looking forward, we’re excited for our secret santa and many more great seasons of band! 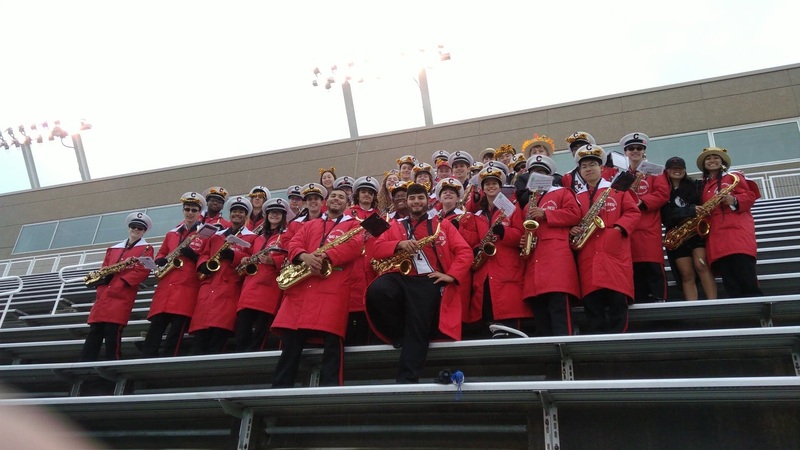 The openest, snuggliest, mintiest section of the band, the Saxes have been absolutely killing this season with a panache never exhibited before! Starting with recruitment, we had a phenomenal turnout, with over 50 saxes packing the band center for First Night! Pizza and ice cream were had, and classic SaxHouse mainstays such as Eagles are Turning People into Horses and NumberWang were watched. We had many first-time sax players join us and every single one of them has done an astounding job learning the ropes! Our away trips have been fun so far- we threw a pool party and sang to wedding guests at Brown, and roamed through Princeton for the legendary Hoagie Haven. We’ve added two new cheers to our repertoire, “My Shiny Teeth and Me” and “Funky Town”! As we’re closing out the season, we are preparing to tear through the Big Apple parading in the Sy Katz Parade! Saxes for life! 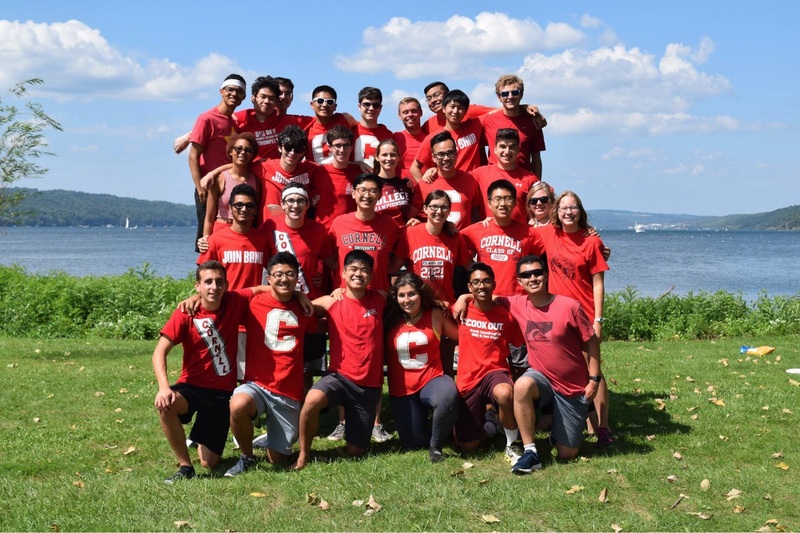 The Trumpets are having an amazing Fall 2018! Our recruitment this year nearly doubled our ranks, and we’ve never sounded better. Some of our new members have never marched, some have never played trumpet, and some haven’t done either; but, everyone is having a good time trying! On the field, we’ve been told by ShowComm more than once that we are the best looking section, and we continue to mess around because of it. Pony Siper ‘20 and Spot Ellert-Beck ‘20 nailed the solo from “Welcome to the Black Parade”, while learning shows was made excellent and easy by Showcomm Chair Buckets Kozma ‘20. 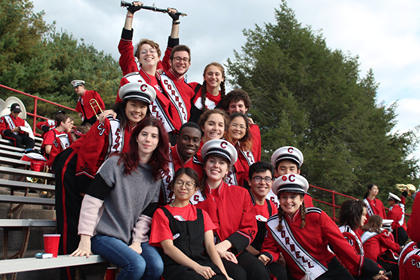 Buckets also helped make pep band a blast as conductor and all his hard work was recognized by the band with his election as our 2019 Drum Major! Our snacks have been boujee-er than normal due to our wonderful Trumpet Mom, Tips Han ‘19. 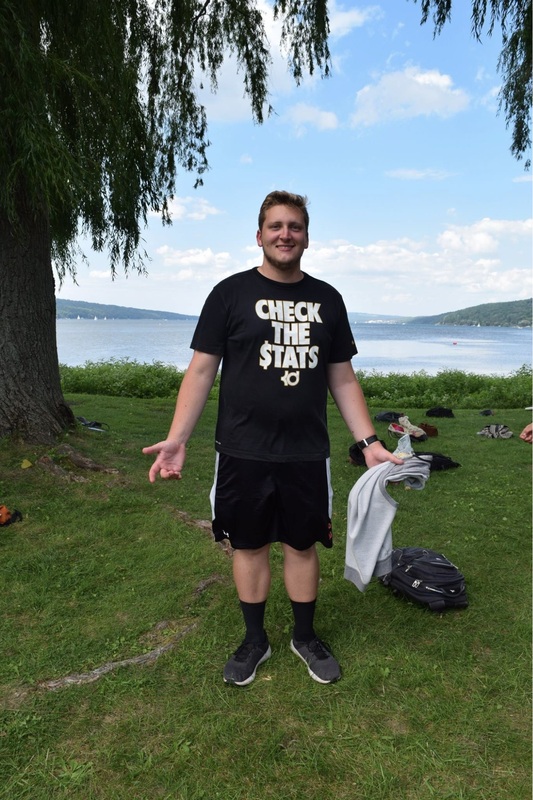 Jeff Van ‘19 continues to be swoll as our Head Field Manager, with a huge amount of help from Molly Bergin ‘19 as historian. Off the field, we’ve had a lot of dinners, board game nights, and even a few Forums. In some ways the section changes, but in many ways, it stays the same. Lastly, thanks to trumpets young and old for making this season excellent. Here’s to an amazing 2018. The Horns gained three wonderful new members this semester, but our three beloved seniors have marched their last show. Saying goodbye to Maria, Lauren, and Brandon will be difficult, but we’ll enjoy the semester we have remaining with them. The horns have continued to be a very tight knit group. Whether it’s bonding over a love for Waluigi or applying temporary tattoos on away trips, it’s easy for us to find fun when we’re together. 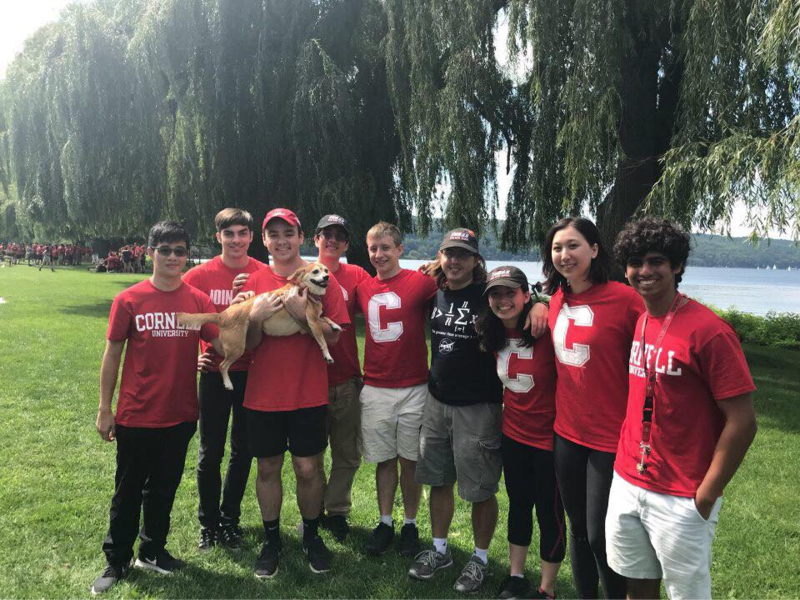 Many of our horns are also pep band members and many play or sing in assorted musical groups/organizations on campus; so if you ever hear music at Cornell there’s a good chance that a horn is involved. Da Bones are still going strong! With marching season coming to a close, we are excited to head into the spring for a whole new bonerush with the freshbones! They are the most wholesome group you could ever know! We’ve had everything from pumpkin carving to board game nights to mac and cheese nights for section bonding. Every second is pure and full of love! We anxiously await to see who will step up to the role of Section Leader for 2019! With nine seniors leaving us, we are happy to pass on the reigns and see the new generation of bones take over. This year we hope to bring back bone pants and maybe even section hoodies! Bone mugs are still in the works, we hope to order soon if the company can get the stencil right! Times may be rough and rapidly changing, but the bones are resilient and stick together through and through. Family don’t end with blood- the bones are proof of that! We hope that all is well and that we will see you soon! Come visit your family! We miss you all! 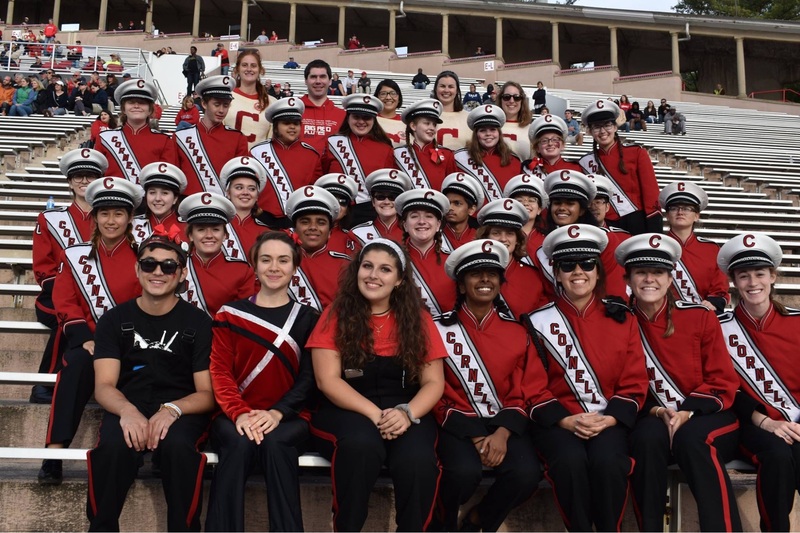 The Tubae have had a fabulous 2018 season! We’ve welcomed two newbas: Bowen and Keshav! This season, we kind of did the Tuba 500. We even continued to dominate the frisbee game during practices! We also almost won the annual band paper drive after collecting the most sheets of paper! As per usual, tuba report time is alive and well. Thank you to our seniors for a great season! You guys will be missed. See y’all soon! The Guard is closing out yet another great semester! Through a lot of hectic rehearsals and cardio-heavy drill, we have pulled off some fun shows and had a good time doing them. 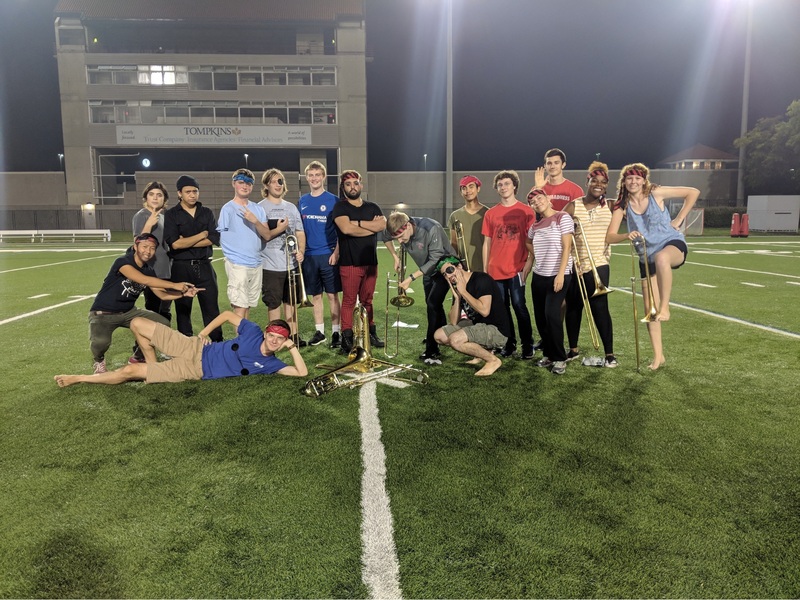 We gained several fabulous new members this season to more than double our size, including a few who have never spun before and are now killing it on the field. The season started off strong with a fabulous homecoming and a great time hanging out with alumni. It has since seen us through two back-to-back trips to Brown and Princeton and a Friday night game under the lights. This season we have continued to expand on our traditions and we have established ourselves as one of the wholesome sections of the band. From getting lost in a corn maze in the backwaters of Upstate New York to getting crepes in a dark alleyway of Providence at midnight, the fun never stops! 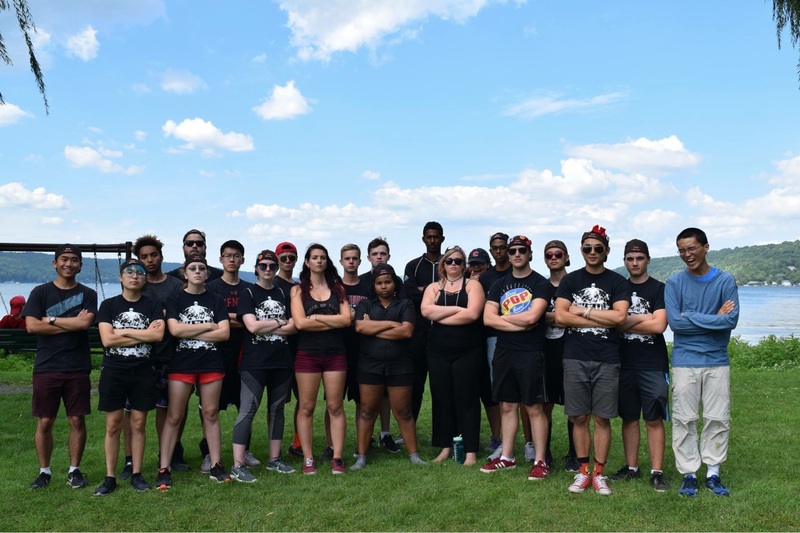 Congratulations to all of our returning members for a successful year of dominating Bandstaph and to Eggily Grigg ‘21 for slaying as the leader of our rifle line. We certainly are looking forward to another year of spinning and fun! The Percussion think they’re too cool for BandNotes, but here is a picture of them anyway! Their section leader was upset that they took a picture without him, so here he is!